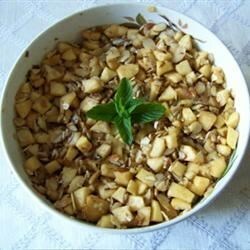 "Sweet and tasty Haroset is made with apples, cinnamon, honey and sweet wine. Serve chilled or at room temperature." Place the apples and walnuts into a large bowl. Mix together the cinnamon and sugar; sprinkle over the apples. Stir in the honey and sweet wine. Serve immediately, or refrigerate until serving. This recipe tastes like unbaked pie filling to me. This is a basic, very good haroset recipe. I split the batch in half and used apple/grape juice instead of wine with half and it was perfect for the kids. Thanks! We are non-alcoholic so I substituted apple-grape juice for the wine. Excellent fruit salad. Easy to make for a crowd. Good, basic recipe. I use all honey rather than adding white sugar. Most of the ingredients you can add to taste.